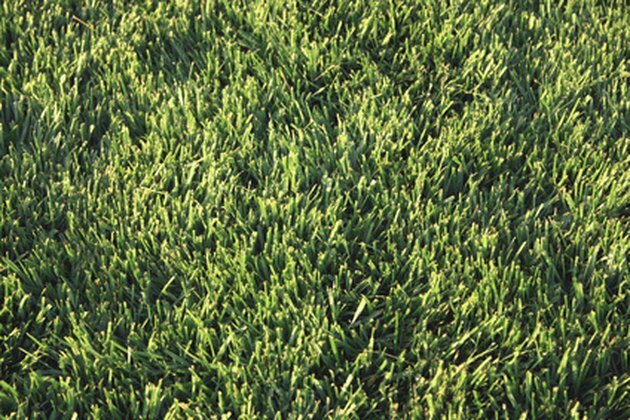 Ironite is a product used to make lawns greener and more attractive. Plants suffering from nutrient deficiencies may appear yellow. Ironite re-supplies nutrients by providing nitrogen, sulfur, calcium, iron and other minerals. Because of the low amount of nitrogen -- 1 percent. Ironite will not burn plants and grasses. Using Ironite fertilizer requires calculating the square footage of your yard. You will need to adjust your fertilizer spreader's setting, remove product from unintended areas and water in the Ironite. Because of its low nitrogen content, Ironite will not burn your lawn. Measure the area of your yard. Using a tape measure, find the length and width of each section of your yard. Multiply the length times the width. This gives the square footage or area of your yard. For example, a yard measuring 150 feet long by 75 feet wide would have an area of 11,250 square feet. Add up the individual areas of your lawn to get the total square footage. For example, if your backyard measures 11,250 square feet and your front yard is 7,000 square feet, the total area is 18,250 square feet. Calculate the number of bags of Ironite you will need. A standard 10-lb. bag of Ironite granules covers approximately 1,000 square feet. For 18,250 square feet, you would need 19 bags to sufficiently cover the entire landscape. Check your local weather forecast. Ironite does not recommend distributing fertilizer before a heavy rain. Place the Ironite in your fertilizer spreader. Adjust your spreader setting. Ironite recommends different spreader settings based on the make and model. For example, it recommended using a setting of "9" for a Vigoro rotary spreader and a setting of "13" for an Earthway drop spreader. A rotary spreader broadcasts or sends fertilizer outward via a rotary wheel. A drop spreader drops the granules straight down from a hopper or container. Spread the Ironite fertilizer on your lawn. Water the fertilizer in with a garden hose or sprinkler system.